Dein-Rennpferd.de is an Affiliate Marketing partner of German horse racing and the horse racing platform for bettors and horse enthusiasts. 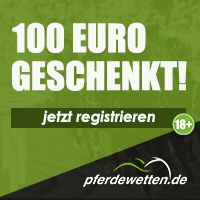 It’s the first German-language website making it possible for everyone easily to share in a racehorse via the Crowdinvesting principle and to profit with some luck from race winnings and sale proceeds of the own race horses with a few mouse clicks and without effort. Furthermore, your racehorse is always only one mouse click away from you. It doesn’t matter where you are. You can find news, videos and events about your racehorse on dein-Rennpferd.TV. The third part of dein-Rennpferd’s website is addressed to all bettors. On the dein-Rennpferd betting site, you will find the best bonuses, the current odds and especially the craziest stories from the racecourses of this world. The best place to follow your passion for horse racing: Become a racehorse owner! The motivation of each individual may be a different one: Whether the fun and joy of sharing the experience of “owning a racehorse” take the centre stage or the intention of saddling the next derby winner and to bring out a respectable profit from the hobby sometime. Nothing of them is impossible with dein-Rennpferd.de. One fact is always in the foreground: Everyone can experience the exciting and unique feeling of owning a racehorse! The exclusive “Sports of Kings” becomes a unique experience for everyone! The world of horse racing is so complex and interesting, so that boredom will never arise. But on the other side, beginners often feel a bit stumped for an answer on the racecourse. Therefore, dein-Rennpferd answers all important questions concerning the topics horse racing and betting. With the help of our comprehensive question/answer sites and articles with the most important technical terms of the world of horse racing, every beginner becomes rapidly an expert for racehorses. We are the best site for horse racing beginners to get into the exciting world of racehorses. Thanks to our advertising partnerships with online horse betting providers of the German horse racing, we are not only able to offer a comprehensive information platform for beginners concerning betting and horse racing, but also different options to get a share in a racehorse or betting bonus discounted or for free at our partners. you gain access to your personal user account from which you can manage your future racehorses and you will not miss any race, any information or videos of your racehorse. you can get in touch with other racehorse owners and talk about the topics racehorses and betting. you have the possibility to make your friends and family members a very special gift. Give away an experience bundle consisting of VIP entrance tickets to a race day in Germany and a share in a racehorse…. The donees will be amazed! In future you will also find the dein-Rennpferd offer in English. This offers everyone from all over the world the possibility to share in racehorses out of German breed and to follow the tracks of “Danedream” and “Novellist”, the two most successful German horses in the recent past, and their owners. We recommend first to watch our FAQ-videos to rapidly get an insight into the website contents and operating modes from dein-Rennpferd and to get to know the glittering world of horse racing. Have fun and enjoy our offer! Dein-Rennpferd. Experience. Thrill. Together.